As a family we love pizza. Its super yummy and super easy to make. You can load it up with vegetables and the kids never know. I've made a homemade pizza dough for quite a while now and it always turns out really yummy so I thought I'd share my recipe. That's it. Just five ingredients. I said it was super easy. You simply mix the flour, salt and yeast. Make a well and add the oil and most of the water. Mix together and add a little more water if you need. Some days I use 200ml some days I only use 150ml, it all depends so just watch it. You need all the flour to stick together but you don't want it too sticky that it sticks to your hands while kneading. Once you have it roughly together pour it out onto a floured surface. I find that its easy to work with your hands. Gently knead for 5 minutes. It should come together in a smooth ball. Next leave it to rise for an hour or so. You don't have to do this but I think it helps. After the hour gently roll out into a pizza dough shape, you can use a rolling pin but I find it easier to use my hands to push the dough into shape. You don't want to overwork it. Next up is to add your sauce (we use tomato puree) and add your toppings. We like ham, sweetcorn, spinach and cheese but you can have anything you like really. Cook on 200c for 10-14 minutes or until the dough goes slightly brown at the edges and serve. I normally let Paige help and add the toppings as she is more likely to eat something if she helps makes it but to be honest this pizza is always a big hit. 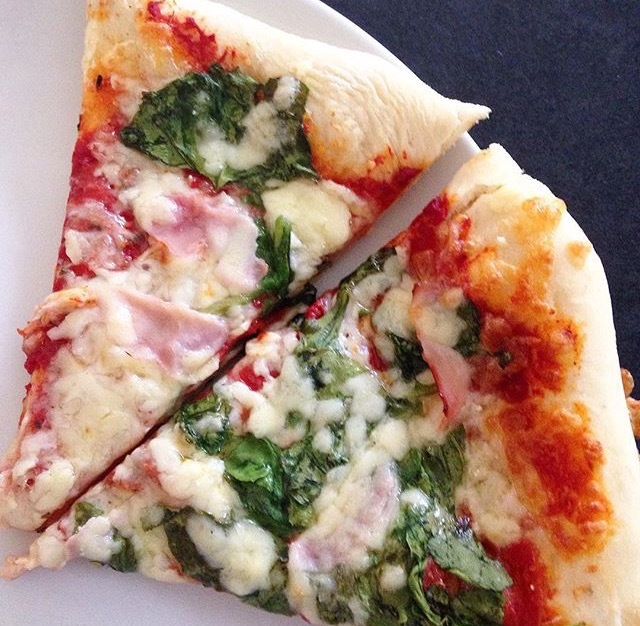 There's never any left, even with the spinach on top.